Narcolepsy is a sleep disorder that is very misunderstood. The most common reaction is ‘Oh that’s that thing where you just fall down asleep on the spot isn’t it?’. Well, it’s not exactly that, and it’s much more than that. What most people confuse it with is the symptom of cataplexy, which is unique to narcolepsy, but not the only symptom of narcolepsy. When people experience cataplexy, it is not falling asleep, but it is complete loss of muscle tone. Sufferers experience it most in emotional situations, which could be a shock, surprise or a laugh. These and other emotional responses cause a physical reaction in the body. When somebody with cataplexy collapses, they will look asleep because all muscles have relaxed, including their eyelids. However, if you physically opened their eyelid they would be able to see. This is not to be confused with another symptom of narcolepsy which is excessive daytime sleepiness (EDS), a consequence of not having a good night-time sleep quality, which is often affected by REM disorder, hypnogogic hallucinations and sleep paralysis. This manifests during the day as EDS, automatic behaviour and other consequences of chronic sleep deprivation and fatigue. A friend of mine once said to me ‘You are the one person I know who really could fall asleep on a washing-line!”. It is also common for people with narcolepsy to fall asleep during a conversation, or face flat in their dinner, but you can usually feel that kind of sleep attack approaching. Anyway, that’s the medical stuff out of the way, even though it doesn’t touch the surface of what’s actually going on inside. The medical textbooks go nowhere in explaining the psychological or social aspects of narcolepsy. I was diagnosed with narcolepsy myself about 7 years ago, after probably about 16 years of being affected by extreme daytime sleepiness. I had noticed a huge increase in sleepiness in my 2nd year at University, to the point where I slept through most of my classes, and really only got through and passed my degree because I had a really good friend who would give me his notes after class and say ‘you can copy these and bring them back tomorrow’, and I studied mostly during the night, oh did I mention the frequent insomnia? My symptoms were often regarded by doctors as stress, as a result of a busy lifestyle studying, working and bringing up two sons by myself. When I finally had the tests (2 nights of overnight sleep studies with about 70 electrodes attached all over my body, and also a lumbar puncture or ‘spinal tap’), and got the diagnosis I thought ‘Great, now they can fix me and I can get on with my life!’. Not so easy. It can’t be cured. A pill won’t fix it, not without having the side-effects of the medications to deal with. At best, it can be managed to a degree. The success of that management comes down to how well you can manage it, and adapt your lifestyle to suit. Before the diagnosis, I had had to give up my own business, which I loved, and I had begun working at a regular job for a large organisation. This turned out to be disastrous. I found it impossible to work to someone else’s schedule, with stringent targets attached which caused additional stress and exacerbated my symptoms. At least with my own business, I had a degree of autonomy which had enabled me to an extent to carry it on for 8 years, much of which was spent working during the night, as I had during my University years. What was most worrying about working for someone else at an office job was that I couldn’t control when I had to drive to work and home, and I had some pretty scary moments during that time with driving whilst sleepy. Although I had a manager who tried to help as much as possible to get my shifts changed and ease my targets, there was a lot of resistance from the company. I changed jobs and the problems became even worse when I had a less understanding line manager and company, and that was a huge multi-national financial organisation. In the meantime, the chronic stress is what I believe caused me to develop fibromyalgia, a chronic pain disorder. I ended up losing my job, and sunk deep into the depths of despair for a couple of years. I felt like I could never have a ‘normal’ life. I became increasingly frustrated that I felt I couldn’t be ‘normal’. It upset me when people judged me as lazy because I slept late in the mornings and needed to sleep during the day. I tried to explain to people but they just didn’t understand. I thought they didn’t want to understand because they just wanted to knock me down. Since I had my ‘breakthrough’, and completely changed the way I think, the narcolepsy has become so much easier to deal with. I now realise that other people CAN’T know what it is like to deal with, as they don’t experience it themselves. That is not their fault. However, I have also come to realise that if they can’t be around me without feeling the need to pass judgement, and have no interest in accepting me as I am, then I can choose not to be around those people. It’s not about judgement, it’s about ACCEPTANCE. I have discovered many values I did not know of before. I am not so quick to judge others. I am aware there are a lot of ‘invisible’ illnesses that people are dealing with. People often say to me ‘There’s nothing wrong with you, you look ok to me’. I have come to know a lot of people with narcolepsy, rheumatoid arthritis, fibromyalgia and many other conditions that people cannot see on the outside. What me and my friends all have in common is a ‘warrior spirit’. We rarely complain. We are much more accepting of others. We focus on our blessings far more than our limitations. I have learned that just because something is what most people do, it does not mean that is everybody’s ‘normal’. A high proportion of the population may sleep from 11pm to 7am. That may be normal for them, it doesn’t mean my tendency to sleep roughly between 3am and 11am is any less normal for me. My need for a sleep during the day may not be normal in the UK, but would be perfectly normal if I siesta’d in Spain. I have learned that the biggest problem I had was not the narcolepsy, but more to do with expectations. Other people’s expectation that I ought to be able to function as they did. And my own expectation that I ought to be functioning as others did too. I have learned that many people are fighting a battle that we know nothing about. I have come to consider myself extremely fortunate and grateful for the health and wellbeing that I do have. There are people struggling more than I, yet are also happy and grateful for what they DO have, rather than worrying about what they don’t have. For example, I don’t have the symptom of cataplexy. Another misconception is that ALL people with narcolepsy have that symptom. That is the reason it took me so long to be diagnosed. However, it is now estimated that at least 30% of people with narcolepsy do not have the cataplexy symptom. I cannot imagine how unsafe that must feel if you’re out and about, especially the risks of head injuries, let alone the reactions of people around. Julie Flygare is an incredible lady who does live with narcolepsy and cataplexy. She began experiencing symptoms while at University studying Law. A young, fit, healthy grade A student with a whole life of plans and expectations before her, her world was turned on it’s head with the onset of cataplexy symptoms. Julie has written the best book available that illustrates what it means to live with narcolepsy. What I love about it is that it is not a ‘poor me’ illustration at all, but a positive, inspirational demonstration of how the choices you make to live your life will affect your level of success in managing the condition and finding happiness in your life. It may not be what you planned, but it may be your purpose in life. 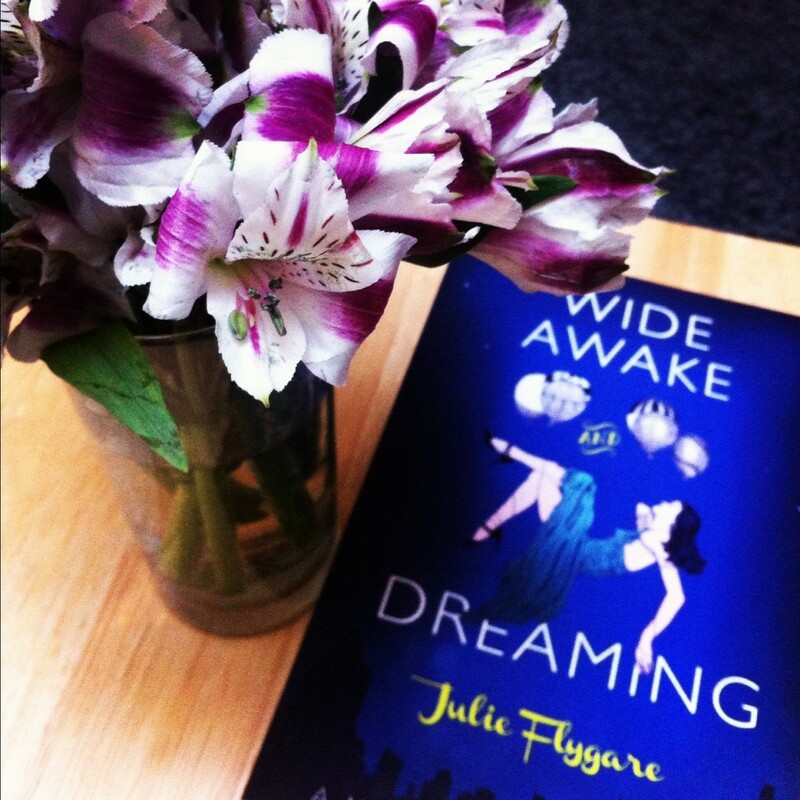 Julie is generously giving away her book, Wide Awake and Dreaming: A Memoir of Narcolepsy, for FREE this weekend on Amazon. Julie Flygare was on an ambitious path to success, entering law school at age 22, when narcolepsy destroyed the neurological boundaries between dreaming and reality in her brain. She faced terrifying hallucinations, paralysis and excruciating sleepiness aspects of dream sleep taking place while wide awake. Yet, narcolepsy was a wake-up call for Julie. Her illness propelled her onto a journey she never imagined from lying paralyzed on her apartment floor to dancing euphorically at a nightclub; from the classrooms of Harvard Medical School to the start line of the Boston Marathon. Winner of the San Francisco Book Festival Award for Biography/Autobiography, Wide Awake and Dreaming is a revealing first-hand account of dreams gone wrong with narcolepsy. It s the brave story of one woman trampling over barriers and finding light in the darkest of circumstances. Julie shows that it is not always about saying Goodbye to the life you had, although I would certainly say there is a grieving process that I went through, but discovering what you can create, which often involves thinking outside the box. Check out Julie Flygare’s website and blog here. I still have the physical symptoms and limitations of narcolepsy. I have just learned that I have had to open up to new possibilities I could never have dreamed of before, and when I find something that inspires me (of which I have found many), it makes life so much more enjoyable. There is also another book, Aberrations, a fictional novel, based around a character with narcolepsy. Written by Penelope Przekop, who has subsequently become a personal friend of mine, I read this several years ago and thoroughly enjoyed her portrayal. Twenty-one-year-old narcoleptic Angel Duet knows her father harbors secrets. He loves and protects her, but his suspicious refusal to discuss her mother s death drives Angel to worship an image created from the little history she does have: her father’s sketchy stories and her mother’s treasured photography, studies of clouds that have hung in the their foyer for more than twenty years. When her father’s girlfriend moves in, the photographs come down, and Angel’s search for truth becomes an obsession. As she struggles to uncover the past and gain control over the narcolepsy that often fogs her world, Angel descends into a dizzying realm of drugs, adultery, and confused desire that further obscures reality. If you don’t have a Kindle, you can still read the book for FREE by clicking the picture in the right-hand sidebar and downloading the FREE Kindle Reading App. This entry was posted in FREE Stuff, Recommended Reading and tagged challenge, empower, Health, inspiration, narcolepsy, overcoming adversity, personal power, positive attitude, self improvement. Bookmark the permalink.